On Sunday, December 23, 1951, a fire in the baggage car attached to the Toronto, London & Windsor C.N.R. train caused extensive damage to the mail. The letter shown below was salvaged from the fire. 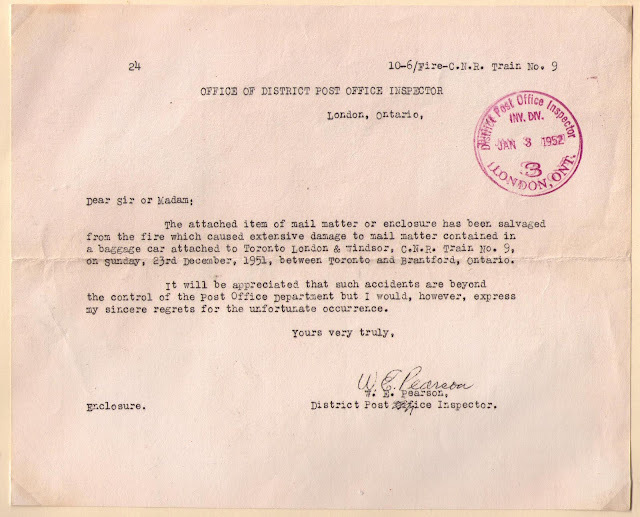 The surface letter was mailed from Battersea to Sarnia, Ontario, December 3, 1951. The damaged letter was enclosed in a Canada Post Office ambulance envelope, along with a note explaining the cause of the damage. country you are contact him now . antoniocaso666@gmail.com or call +393510025283.